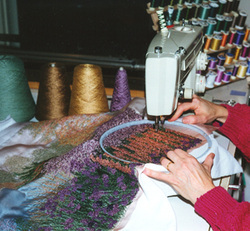 I enjoy teaching and my lectures, workshops and classes include free-motion machine embroidery and an Encyclopedia of Fiber Manipulation Techniques. Scheduled workshops: I offer scheduled one-day workshops several times each year in my studio in Columbia, MD for groups of 3-4 students. The class runs from 9:30-4:00 and costs $150 per person. I provide a vegetarian lunch. There is a supply list, a $22 supply fee, and students need to bring their own sewing machines. Please contact me to add your name to my list of potential students. NEW! Private workshops: I am happy to schedule a private one-day workshop in my studio just for you, any time that meets your needs! The cost is $350 for one person and includes lunch and the supply fee. You’ll need to bring your own sewing machine. Or, make it even more fun and bring along one or more of your creative friends. Your friend(s) pay $50 per person (and lunch and the supply fee are included). Contact me to schedule a private workshop! Workshops at Craft Schools: I often teach classes at craft schools. Snow Farm in Williamsburg, MA is one of my favorites! Lectures, demonstrations and classes for guilds: I am also available to lecture, teach a class, demonstrate for your art, embroidery or quilting guild. ﻿Contact me﻿ to schedule a workshop, lecture or demonstration. A one-day workshop for students who have already taken a workshop with me. No supply fee!